. 82nd airborne division . The 82nd shoulder patch represents a double “A” printed in white inside a blue circle superimposed on a red square. This symbol means “All America”. Its origin goes back to World War I in France; the 82nd division of infantry is then composed of soldiers coming from each state of the Union. When the division became an airborne division, a crescent imprinted with “airborne” in white on a blue background is placed at the top. The origin of the 82nd goes back to World War I, a 82nd Infantry Division is formed with soldiers originating from Georgia, Alabama and Tennessee. The division trains in Camp Gordon in Georgia. It was sent to France. They fight in Argonne, in the sectors of Toul and of Marbach then at the offensive of Saint-Mihiel. From October 10 to 31, 1918, the division gained ground on each side of Aire in the East of St Juvin. It was the division which remained the longest on the front line. It is on March 25, 1942 that the 82nd is reactivated at Camp Clairborne in Louisiana under the command of General Omar N. Bradley. At the beginning, this division is a division of infantry. It is not until August 15, 1942 that the division takes wings and thus becomes the first American airborne division then commanded by Major General Matthew B. Ridgway. At same time, members of the 82nd left the formation to form a second airborne unit, the 101st. the 82nd loses the 327th Glider Infantry Regiment GIR as well as the 321st and the 907th Glider Field Artillery Battalion GFAB. On the other hand, the 80th Airborne Anti Aircraft Battalion AAAB will be activated. In October, the division is dispatched to Fort Bragg in North Carolina to pursue its airborne training. 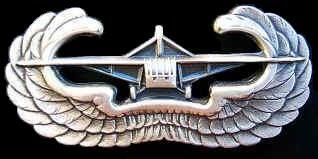 On October 14, the 504th Parachute Infantry Regiment PIR who had formed on May 1st at Fort Benning in Georgia joined the 82nd. Before leaving overseas, the division would consist of the 325th GIR, the 504th and the 505th PIR. At Fort Bragg, the soldiers trained vigorously; the paratroopers jumped out of planes, the C-47 and the gliderborne troops were at work in the 15-man WACO-CG4A gliders towed by transport planes. 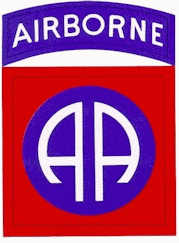 In the spring of 1943, the 82nd “AA” became the first airborne division sent overseas. On May 10, 1943, they landed by troop ships in Casablanca, North Africa. From there, they moved by rail to the dusty area of Oujda-Marhnia for training. The life during this period included training as well as military parades for Generals such as Eisenhower, Patton, and Clark or for the General of the Spanish Morocco. For the first time, 105mm Howitzers were transported by sailplane. Then, division was moved to Kairouan in Tunisia. That would be their departure point for their next mission, the liberation of Sicily. It is the first airborne offensive of the military history of the United States of America. After the victory in North Africa, the allied forces think in the future for a balance in Europe. The planning of the invasion of Europe was held in January 1943 during a conference enters Roosvelt and Churchill. The goal of the plan was to make pressure in the belly of Europe in an effort force the Germans to disperse their troops. The plan aimed at Sicily in first part. The name of the operation is Operation HUSKY. The airborne operation was divided into two parts, the first for the English forces, and the second for the American forces. The first wave is carried out by Colonel James M “Slim Jim” Gavin, ordering it 505th PIR reinforced by the 1st battalion of 504th PIR. They were organized in regimental combat team (or RCT). They were parachuted in a sector around Gela on the banks Southerner of Sicily, their objectives were to control the roads leading to the beaches of unloading of 1st Infantry Division “Red One” and to control the drop zone for future operation. They were to also deal with 16 pillboxes who were occupied by German artillerists and who by their fires controlled all the movements on the close roads (see below). It is under the almost full moon that the parachutists flew over the sicilian coast within the deadlines and jumped on their DZ on July 9, 1943 on a zone of 80km2. 505th PIR and company B of the 307th jumped on Sicily on July 10. On July 11, a group of engineer was to be sent on the line Biazza. But they were parachuted too far behind the enemy lines. Carried out by Lieutenant Colonel Arthur Gorham, which was killed during the combat, part of the 1st battalion of 505th PIR achieved the major part of the mission. More with North, it Lieutenant Colonel Charles W. Kouns was captured after resisthaving valiantly resisted with men of sound 3rd Battalion of 504th PIR with Niscemi. Captain Edwin L. Sayre took the head of a small group and attacked a farm in which it was cut off 60 Italians armed with machine-guns. 6 grenades launched by S/Sgt Oscar L. Queen, concluded the business. The catch of Comiso, Noto and Raguse were allowed by airborne operations. To be transported, the paratroopers used in addition to their feet, of the bicycles, the mules and the caterpillars Italians. Carried out by Gavin, 300 troopers, 3 howitzers of 75mm Howitzer and 2 anti-tank guns faced an important counter-attack coming from Viazza Ridge. The counter-attack arrived up to 15 meters of the HQ of Gavin before being finally pushed back by artillery and the courage of the men. 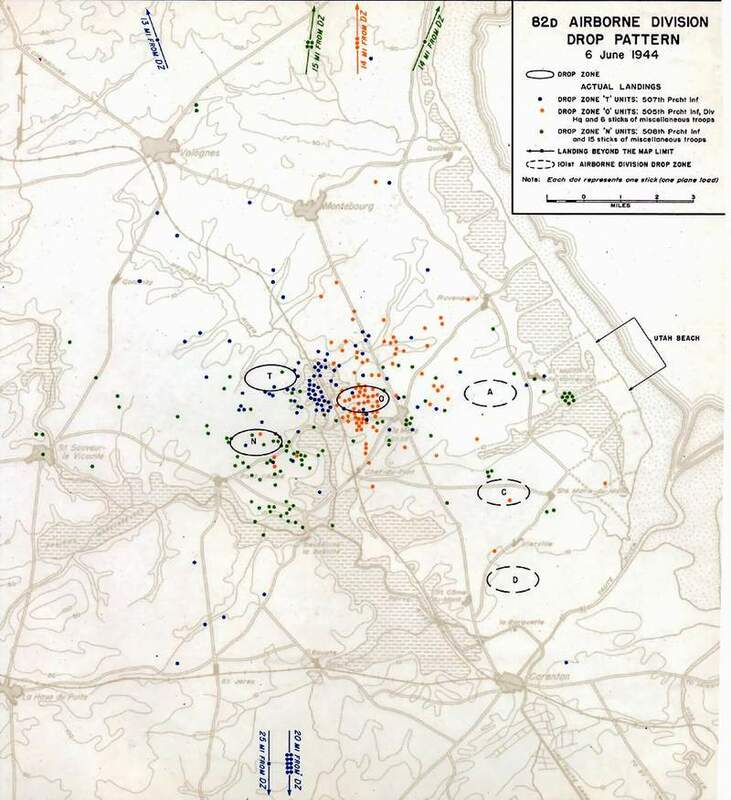 After days of heavy combat, Patton decided to reinforce his center with more than 2000 parachutists with 504th PIR, 376th PFAB and the company C of 307th. The second wave is made up of the 1st and 2nd battalion of the 504th, led by Colonel Reuben H. Tucker. They took off from Kairouan in Tunisia. While approaching the Sicilian coast, the formation of C-47 was suddenly under the DCA friendly fire… Indeed, all day long, the German activity was very intense; the DCA servants were stressed out. However, the navy and army officers were quick to advise everyone of the C-47. But in spite of that, they opened fire on the planes. It was devastating. 37 out of the 144 planes were hit and 23 were taken down. The airborne forces reported a 10% loss. 81 paratroopers were killed, as well as the assistant of the Divisional Command, the Brigadier General Charles Keerans. After flying over twice along the sicilian coast and with more than 2000 impact in its fuselage Colonel Tucker‘s plane finally reached the drop zone near Gela. In the morning, only 400 paratroopers out of the 1600 had reached their DZ (Drop Zone). The others were dropped everywhere on the island. This situation quite precarious gave however an advantage to the allied troops. Indeed, the small groups dispersed caused quite some damages when attacking convoys, by destroying the communication lines which made the Germans believe they were outnumbered by Americans! They over-estimated the number of manpower by more than 10 times the real number. This tragedy cancelled certain flights, in particular the one of the 327th GIR. However part of the HQ and other more specific troops traveled to the airfield of Ponte Olivio until July 16. At that time, the 504th and 3rd battalion of the 505th fought although they were outnumbered by men and equipment, and took over the blockhouses. By attacking in small group, they prevented the enemy to put together a significant counter-attack. However, it was a completely other story for the Division Hermann Goering! The 82nd used all its strength and courage to block and prevent the panzers of this division to take over the drop zone and moving towards the bridgehead. And in spite of that, division will progress; it will be reinforced on July 12 by the 39th Regiment Combat Team of to the 9th Infantry Division. They will take the roads to Delle Canno of Fiume on July 18. On July 23, division moved along the coastal road, taking over the area of Marsala-Trapani, the Western coast of Sicily. In August 1943, it occupies Trapani. On August 22, 1943, the division was flown to Tunisia to get more equipment. Once back to Sicily, it covers the sectors of Comiso, Licata, Castelvetrano and of the Trapani airport. In 5 days, the 82nd traveled nearly 94 kilometers and approximately made 23.000 prisoners. The 82nd was sent to Kairouan in Tunisia to recuperate and to prepare the invasion of Italy. After Sicily, the 504th PIR, the 376th PFAB and the company C of the 307th get together to create the 504th RCT. The same is true for the 505th PIR who got together with the 456th PFAB and the company B of the 307th to create the 505th RCT. After their return to North Africa, the reinforcements and the substitutes arrive. The 3rd battalion of the 504th PIR is once again sent on a mission. This time, they are sent to Bizerte for a special attack on the beaches with the 325th GIR and the Rangers. The 1st and 2nd battalion of the 504th PIR and of the 505th PIR get back to Sicily to be dropped off on Capua, the drop was cancelled as the enemy was waiting on the drop zone. Another disappointment for the 82nd was the cancellation of the jump on Rome. The last piece of information from the secret services revealed that the “negotiations” between the General Taylor and the Marshal Badoglio were a trap. In conclusion, at the beginning of September, the 3rd battalion of the 504th PIR and the 325th GIR join the Rangers. They are brought amphibiously to Italy. The company H and a group of rangers debarked on the Italian coasts on September 9 in Maiori. They reach inland very quickly to take over the Chiunzi pass and an essential railroad tunnel. The second operation for the 82nd was to jump on the bridgehead of Salerno on September 13, 1943 in support of the 5th US Army commanded by General Clark who was in a critical situation. The situation was seriously critical; the German Marshal Albert Kesselring was sending troops and panzers to the bridgehead. The principal elements of 7 out of 8 German divisions in Southern Italy began a constant bombing of the allied units bottled up on the beach. The bridgehead began to fray when, on September 12; the Germans launched a violent counter-attack pushing back the bridgehead 10 km. The situation became so critical that General Mark Clark gave the order to the 82nd to jump directly on the bridgehead. A plan was immediately conceived to send the 504th PIR. Pathfinders had to jump ahead to mark the town of Paestum DZ in the South of Salerno. They used cans filled with sand and soaked with gasoline to set up a fire and to form a “T”. At that time the paratroopers embarked in their C-47 on Sicily airfields without knowing their destination. They will only know it once in the air. Flying in column, C-47 arrived above the ignited cans which formed a blazing “T” in the center of the drop zone. The 1300 Paratroopers were dropped off and once on the ground, got back together and moved forward based on where was coming the shooting sound and where the fire was situated. The plan worked perfectly except for a company which jumped more than 16km from the DZ. The following night, the 505th PIR carried out by Colonel James Gavin was dropped the same way. The 509th PIB, which was attached to the 82nd Airborne, debarked the same night as the 505th. While debarking far behind the enemy lines in Avellino, it received the orders to harass the German communication lines. On September 15 the 325th GIR left to reinforce the paratrooper’s regiments already on the line. A company landed on Ischia Island in the bay of Naples. The regiment kept moving forward to the Maiori-Chiunzi pass to join the Rangers and the 319th GFAB. The division HQ and the special units arrived at the bridgehead by sailplanes and boats. The 504th and the 505th PIR arrived at the Maiori-Chiunzi pass by trucks and on board of LCI. The following days were, according to General Clark, paramount for the rescue of Salerno bridgehead. While the 504th PIR (without its 3rd battalion) and the 376th PFAB took at the top of Altavilla, the enemy counter-attacked. The VI Corps commander, General Dawley, suggested that the unit drew back. In keeping with the strong spirit of the paratroopers, Colonel Tucker stated: “Retreat, Hell! Send me my other battalion!” the 3rd battalion was sent to him, the enemy was pushed back and the bridgehead of Salerno was saved. 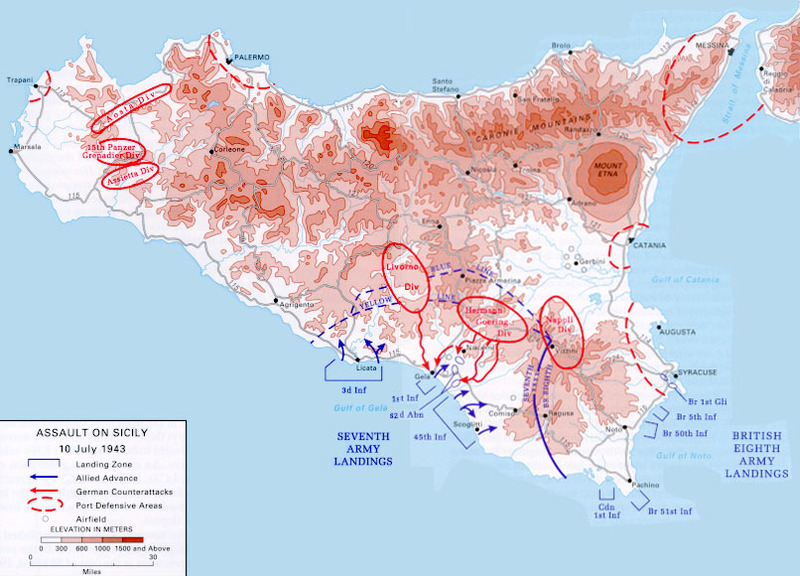 The operation cleared up the sides of the 5th US Army which enabled it to move through the coastal plains and to lead it above Naples. The Germans drew back the same night as the X British Corps including the 82nd Airborne and the Rangers moved forward to attack the peak of Sorrento. Attached to the 23rd Armored British Brigade, the 505th PIR took part in the taking of Naples. On October 1st, 1943, the 505th PIR had the honor to be the first unit of infantry to enter Naples. Major Edward Kraus commanding the 3rd Battalion raised the American flag over the city. 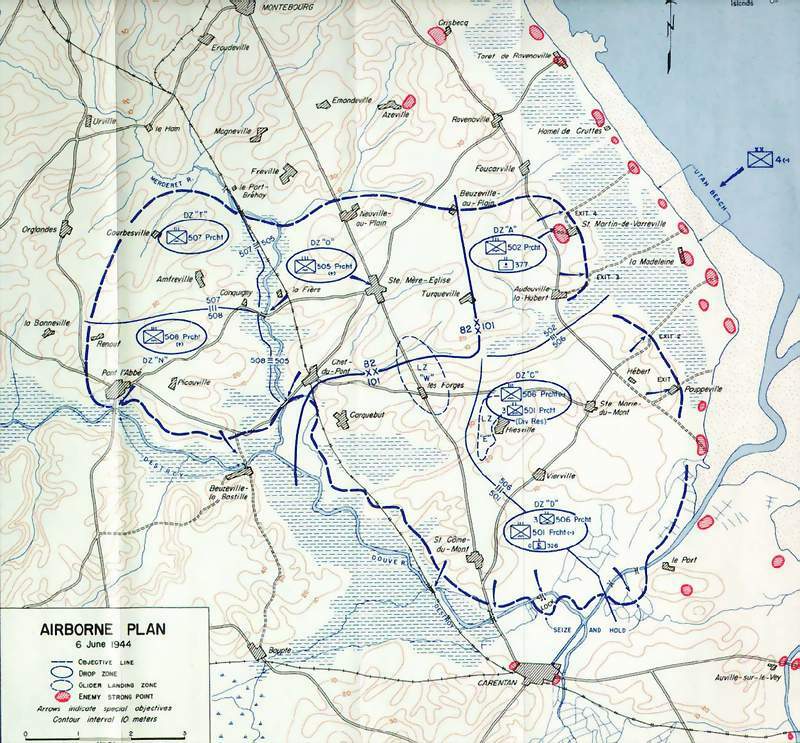 The operation was not only a great success, but it was also a good example of the airborne troop’s mobility: within only 8 hours, the 504th PIR gathered, prepared for combat while the 82nd came up with a strategic plan. They then loaded the planes and jumped on their DZ to enter fight and turn over the situation which was defavorable! Meanwhile the 505th still remains attached to the British troops for a few days to push back the enemy troops down to Volturno. The 82nd began to restore the order in Naples. But a delayed-action bomb placed in a building near the HQ destroyed part of the buildings where was stationed the men of the 307th AEB and of the 407th QM Co.
After Naples, the 504th PIR and the 376th PFAB were detached from the 82nd to join the 36th Infantry Division. On October 29, they took over Gallo. They then fought on the “winter line” attacking hill 687 on December 15, 1943. During several months, in Italy, the 504th PIR fought in difficult terrain against a determined enemy. The regiment attacked hill after hill, evacuating the casualties with mules. 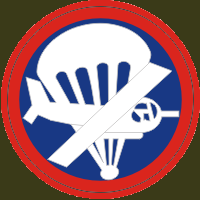 On January 4, 1944, the 504th PIR was withdrawn to Naples to prepare for a new airborne mission. The operation was to be called “SHINGLE” and included an attack behind the coastal city of Anzio 45km in the south of Rome. But it seemed as though even the population of Naples knew about the operation, thus the 504th was happy to learn that boats were unloading and attacking the beaches of Anzio. 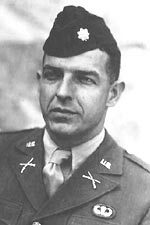 On December 9, 1943, Colonel Gavin is promoted brigadier General and takes over the auxiliary function as commander of the 82nd Airborne. Lieutenant Colonel Herbert Batchellor took over the command of the 505th PIR. During the first months of 44, the units of the division were moved to England to prepare the invasion of France. On March 22, 1944, the command of the 505th is passed over to the hands of Lieutenant Colonel William Ekman who ensured its command until the end of the war. 504th RCT (Regiment Combat Team) including it 504th PIR, 376th PFAB and it 307th AEB. On January 22nd and 23rd, 1944, the 504th PIR debarked on the beach of Anzio. The debarking was carried out without problems until the Luftwaffe planes shot at the boats. The unit debarked under the enemy’s fire and was sent along the Mussolini Channel. After several days spent under the enemy’s fire artillery, the Germans launched a counter-attack to push the Allied back into the sea. The 3rd Battalion with the 1st Britich Army (Guards) took part in the heaviest combat. The company’s forces are reduced from 20 to 30 men. The Company H saved an English General captured by the Germans. For Company I, the losses were such that only 16 men remained. For its bravery and actions, they were awarded the very first Presidential Unit Citations for the European theatre operation. For the remainder of their stay on the Anzio‘s bridgehead (8 days), the paratroopers of the 504th were on the defensive. It was a war similar to the First World War, made of barbed wires, and minefields. It’s during this combats that the 504th was given the nickname of “Devils in Baggy Pants”. On March 23, 194, the 504th PIR was withdrawn and sent back to Naples. The countryside cost lots of human lives but the losses they inflicted to the enemy were 10 times higher. Then, the 504th embarked on board of the “Capetown Castle” to England. At the beginning of 1944, the 82nd Airborne is sent to England (except for the 504th PIR who remained in Italy and will later go to England in March 1944) to prepare the liberation of Europe. The division spent two months in Ireland, Belfast. It was then sent to Leicester and in the area of Nottingham in the mid-February. Credited with two combat jumps, the 82nd was ready for the “NEPTUNE” operation which is the airborne invasion of Normandy, and the prelude of the “OVERLORD” operation. For the operation, the division was reorganized. Two new parachute infantry regiments, the 507th and the 508th, joined the division. On the other hand, the 504th did not take part in it because of the heavy losses this regiment undergoes in Italy. On May 26, 1944, the 82nd Airborne mission in Normandy is ready: to take control of the surroundings of Saint-Sauveur le Vicomte (Neuville-au-Plain, Saint Mère Eglise, Chef-du-Pont, Etienville and Amfreville) in order to prevent the German forces from blocking the units debarked at Utah Beach and to clear up the access from the beaches. To reach these objectives, the division will be parachuted and conveyed by sailplane from around the Mederet in the night of June 5. It is organized in three levels: force “A” (6396 men jumping out of planes, the force “B” (3871 men conveyed by sailplanes) and forces “C” (1712 men having to leave England on June 6 at 6:45 a.m). The day before the operations, the division manpower counts 11979 men, including organic units and services. 20 hours before D-day, the paratroopers of Force “A” are gathered on the grounds of Grantham, Cottersmore, Langar while the sailplanes are concentrated on the grounds of Aldermaston, Ramsberry et Merryfield. The first C-47 having to convey force “A” paratroopers take off on June 5 at 11:15 p.m. The dropping takes place on June 6 between 1:51 a.m and 2:08a.m. Contrary to those in the 101st Airborne, they are relatively precise (especially for the elements of 505th PIR) the drop losses reports 272 men i.e. 4.24% of the manpower. They were among the first soldiers to fight in France. The dropping properly known as is preceded by a dropping of “Pathfinders” teams; their goal is to mark out the ground. The 101st has 9 teams, i.e. 3 for each jumping zone. Thus, if two teams are put out of combat, the third one remains to achieve the mission. All the teams of the 505th reach their mark, the DZ “O” near Sainte Mère l’Eglise. The 507th PIR lands on DZ “T”, to discover a great German concentration patrolling in the sector (Gray castle in Amfreville). Only the team of Lieutenant Charles Ames from the 507th 2nd battalion can set up its equipment. The 508th PIR sector is the village of Gueuteville, on the road of Sainte Mère Eglise – Pont l’Abbé (DZ «N "). They are not any luckier, the Lieutenant Gene William and one of his men land in a sector close to their objective and set up the few pieces of equipment they possess, a Eureka beacon and two holophanes lamps. Due to their dispersion, many Pathfinders teams do not know if they achieved their goal. The luckiest cannot always set up their equipment which is sometimes damaged at the time of parachuting or because of the enemy’s presence. The plan failed, and chaos reigns over the whole jumping zones. The transport and the dropping of the 82nd Airborne troops are given the code name of “BOSTON”. It starts 10 minutes after the 101st. It takes nine C47 to transport one company; a group of man per plane (between 16 and 17) called a stick, 36 for a battalion of a regiment and 117 for a complete regiment. The operation begins badly; a Gammon grenade carried by a paratrooper of the 1/505 PIR explodes inside a plane, killing 3 paratroopers and making the plane ineffective. The first formation takes off transporting the 2nd and 3rd battalions of the 505th PIR with 2 howitzers and the 456th PFAB. The remainder then came from the 505th PIR accompanied by the 307th Engineers and the division HQ, commanded by General Matthew Ridgway for a total of 2120 paratroopers on the way to DZ “O”. Contrary to “ALBANY”, the pilots of C-47 transporting the 505th PIR decides to fly over the cloudy mass, which enables them to avoid some of the Flak shooting. On the DZ “O”, the Pathfinders are ready to welcome their unit with their Eureka beacon and their red lamps. The only problem lies in the approach of the jumping zone at high altitude, which does not allow the pilots to see the red lights in time. The pilots must fly in circles before dropping on the target. On the 118 sticks dropped, 31 landed on or close to the jumping zone and 29 landed at less than one kilometre. 20 sticks fall at less than 3 kilometres and 20 others at further distances. The DZ “N” is the objective of the 508th PIR, it is right in the sector of the German 91.Infanterie-division whose HQ is located at Picauville. Barely helped by the pathfinders, the 2188 paratroopers will land around their jumping zone. 17 sticks out of the 132 will land on the DZ or near it, and 16 at less than one kilometer from it. The DZ “T” is the objective of the 507th PIR, and will be the worst of all the jumping zones. At the opposite of others the jumping zone could not be delimited by reference marks on the ground, like a river or a village. The Flak shootings are the worst, which involves a dispersion of the formations. On the 2000 parachutists only 2 or 3 sticks land close or on the jumping zone. 50 fall at less than one kilometer and 22 at more than 3 kilometers from their objective, like the 180 paratroopers parachuted on Graignes. The division jumped behind the beaches of Utah beach between Ste Mère L’Eglise and Carentan. One of the principal objectives of the D-day was the liberation of the city of Sainte Mère Eglise at dawn by the 3rd Battalion of the 505th PIR under the command of Lieutenant Colonel Kraus with 5:00 a.m. The American flag was raised over the city of Naples. At that point, the invasion forces had not debarkedd yet. The 2nd Battalion of Lieutenant Colonel Benjamin Vandervoort joined in and helped defend against the German attacks. It was the first city to be liberated and never taken back. The General Gavin was able to gather approximately 500 paratroopers and had to leave half of them behind to carry out the others objectives: the bridges on Mederet at La Fière and at Chef-du-Pont. After intense combats, Colonel Roy Lindquist commanding part of the 508th PIR took over Chef-du-Pont. La Fière was also taken over then lost back to the ennemy. It will take two additional days for the American forces to have total control of it. The 507th PIR, in spite of the disappearance of Colonel George V. Millet Jr., gathered several paratroopers to take over the bridge at Chef-du-Pont. They had to face a strong resistance. The 505th PIR crossed the Merderet at the “Kellam Bridge” named after the commander of the 1st Battalion of this regiment, Major Fred Kellam who died for the defense of this bridge. At Le Fière, the 505th PIR had to face a German counter-attack that tried to pass again over the bridge. Thanks to two Bazooka teams, the tanks were pushed back. General Ridgway who had jumped with the 505th set up his PC in a ditch along the hedge. General Gavin’s HQ, was standing along a railway. Sainte Mère l’Eglise was been attacked North and South. On that night, Colonel Robert Winecke, G-3 of the Division wrote: “60% of the infantry, 90% of the artillery Effectiveness in combat: Excellent.” It was a very difficult night for the Paratroopers; they were constantly under the shooting of 88 Germans. And the enemy was trying to break through the lines. The 505th and one battalion of the 325th were to move up North to take over Station and Le Ham and fight the 243rd German at about 8km in the North-West. To carry out this plan, the 1st Battalion of the 325th had to cross a flooded zone along a fill of railroad the night before. While crossing the river, the group got in touch with the unit of Lieutenant Colonel Charles Timmes near Amfreville. But intense combats took place, preventing from fulfilling the mission. The group of Colonel Millett lost. Only few were able to escape. On June 7, the 325th GIR and the other troops specialized debarked by sailplane. In spite of many accidents, Colonel Harry E Lewis had 80% of its regiment gathered in two hours and walked up to Chef du Pont. At “Bridge of Kellam” another counter-attack was launched. The Germans failed to cross Ste Mère. On that night, 400 paratroopers of the 508th crossed the river through a violent attack. Half of a battalion ended up east of Amfreville. And obviously, paratroopers commanded by Colonel Milet were in the West. On June 9, the 3rd Battalion of the 325th GIR backed up by tanks crossed the rivers and set up a bridgehead at La Fiere. It is during this action that le Pfc Charles N. DeGlopper was awarded the “Medal of Honor” for his courage for maintaining the position of its group while the others were crossing the river to put together the beginning of a bridgehead. Native from Grand Island in New York, he was wounded several times, killed many Germans before being killed. Elements of the 507th PIR took part in this attack. They moved South-West towards the forces of the 508th PIR. From its side, a group of the 508th PIR, whose mission was to take A Bridge above Douve à Pont L’Abbe, was stopped by a German battalion right before reaching the city. Lieutenant Colonel J.B.Shanley realizing the higher number of the enemy withdrew itself on hill 30. For 2 days, they fought German units that were trying in vain to overflow the principal landing zones of the paratroopers. This action was considred as decisive to help the gathering of the airborne troops in Normandy and succeed their objectives. The next day, the 505th RIP takes over Montebourg. Station and Ham were liberated on June 12. The 508th PIR Colonel Lindquist with the engineering units set up bridges to cross La Douve in Beuzeville-la-bastille, reached Baupt and captured 16 Renault tanks. The distance separating the forces from the North and the South is only 18km. On June 14, the 325th GIR and the 507th PIR attacked the head of the 90th Infantry Division. The next day, the 505th released the 507th to continue moving forward step by step. At the end of the afternoon, any resistance to the East of Douve had ceased. One June 16, “All American” crossed the river to take St Sauveur le Vicomte ahead of the 9th Division who was to cut through the peninsula. The 325th and a battalion of the 508th PIR released Vindefontaine. Within a few days, the whole Division was South of Douve. On June 19, they establish a bridgehead in Pont l’Abbe. The division then attacked the Western side of Cotentin peninsula and take over hill 131 on July 3. The following day, they take over hill 95 taking to Haye-du-Puits. The 82nd Airborne was sent back to England on July 13, 1944, after participating in 33 days of combat, losing 5245 men, killed, wounded or missing. One can read in the division report: 33 days of combats without release. Each mission was accomplished. No conquered ground was abandoned. After the invasion of Normandy, the 82nd Airborne joins the newly organized XVIII airborne Corps. In this corps are also included the 17th and the 101st Airborne. The commandant of the XVIII airborne Corps is General Ridgway. For the 82nd, the command passes into the hands of General James Gavin on August 27, 1944. Meanwhile the 504th PIR has gathered new manpower whereas the 507th PIR joined the 17th Airborne Division. In August 44, Eisenhower puts together the first allied airborne army made up of American, English and Polish forces. This new army was used for the first time in Holland, on September 1944. This plan, invented by British Field Marshall Montgomery, would be the first day airborne attack on enemy’s lines since the invasion by the Germans on Crete. 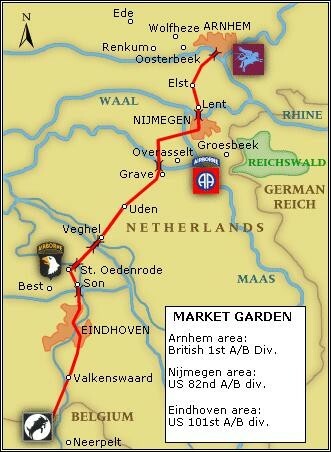 This operation, similar to the German operation, dated September 17, 1944, envisaged the parachuting of the 82nd and the 101st airborne division as well as of the English divisions on Holland, by day, with for mission taking over the road, bridges, and principal cities connecting Eindhoven, Nijmegen and Arnhem and thus facilitating the advance of the armored tanks to the German border. If the operation succeeded it would be the 4th and last jump of the 82nd airborne. The order arrived on September 15, the 82nd had to jump 90km behind the enemy’s lines near Grave. Its mission is quadruple. First of all, taking over the bridges of Grave on Maas and of Nijmegen on the Maas-Waal channel. And finally taking over the heights of Berg En Dahl. The 504th’s objectif was the longest bridge of Europe above the Maas River and several other bridges above the Maas-Waal channel. On September 17, at 12h31, the Pathfinders jumped on their DZ, followed ½ hours later by the remainder of the regiment as well as of the C Company of the 307th Engineers. They were the first to debark in Holland for the greatest airborne operation of the history. The official report, about the opposition that the paratroopers encountered after their jump, states that it was negligible. It was not the opinion of Pvt Edwin C. Raub 505th PIR. His parachute was cribbled by bullets. Raub ended up landing a Flak canon. Without removing its parachute, he killed a German, captured the following one and neutralized the canon. At 18h00, the 504th RCT under the command of Colonel Reuben H. Tucker captured the Grave Bridge after an intense combat. The men took by storm a tower of the bridge in which was an anti-aircraft canon. They used this canon against another similar tower on other side of the river while the men crossed the river on dinghies to remove the loads of demolition placed under the bridge. The Regiment accomplished its mission (except for a bridge the German managed to destroy). At 4h00, the regiment had jumped, had gathered, had engaged combat and had reached its objectives. For the 508th, the enemy’s resistance was more difficult; they faced the paratroopers of the 3rd German Fallschirjäger Division. The combats were intense but the 508th held on the hill which was called the “hill of the devil”. During 2 days, the 3 paratrooper’s regiments of the 82nd combined their forces to take over the bridges of the Maas-Waal channel and pushed back the attempts of the German counter-attacks until the 30th British Corps makes the connection. However, the road of Nijmegen and the railroad bridges which were the last bond remaining with the British airborne forces in Arnhem, remained in the hands of the Germans. The artillery transported by sailplane arrived the second day. Certain zones of landing were still under enemy’s fire. 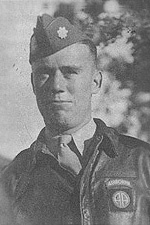 Men such as 1st Sgt Leonard A. Funk watched over the zones of landings. When German tackled the zone of landing of the 508th PIR. Moving ahead of his company, crossing 800 meters out in the open. They destroyed a position of four 20mm guns, then, Funk followed by two other paratroopers attacked a Flak position, destroying the 3 canons and killing 15 Germans. On September 20, while the 508th PIR maintained the Eastern Side, the 2nd battalion of the 505th and the tanks of the 30th British Corps attacked the southern end of Nijmegen and the railroad bridges. The 82nd encountered a strong German resistance. They were fighting from house to house. At the same time, a division of Panzer Grenadier was dispatched to Nijmegen in order to support the counter-attack. The crossing of the river was necessary, difficult, and almost impossible as it had to be done with boats on a 370 meters wide river and under the fire of 88 German, the anti-aircraft canons, the 20mm canons and the machine-guns. Nevertheless, the crossing was ordered. The British tanks were used as cover. On September 20, in order to support the 505th PIR and to fix the bridge of Nijmegen, Major Julian Cook (504th PIR) gave the order to its 3rd battalion to cross the river with the support of the 307ème Engineer Battalion Company C.
26 assault boats were put on the water. 260 men climbed in to attack the other bank where awaited 400 to 600 Germans. They crossed under the quite relative protection of smoke-producers. But because of the wind, the smoke very quickly dissipated. Out of the 260 men crossing, half were killed or wounded! And out of the 26 boats, only 13 made their way back. Some did not even wait for the boats. They dropped their equipment and jumped into water with their rifle on the back. The 504th PIR found the strength and courage to triumph. The British General, Sir Miles Dempsey, testified after having seen the crossing of the 504th PIR, he could only describe the attack with one word: “Unbelievable” On land, the British tanks and the 2nd Battalion of 505th PIR attacked the southern part, passing from house to house. At the end of the bridge, in the south, is found an “island”. On this “island” were 4 self-propelled canons. The paratroopers attacked the canons. They seized the Southern part of the bridge. But only the tanks could cross. Indeed, half a dozen of fanatic Germans had climbed on the structure of the bridge. They were quickly put out of combat. The 6.Fallschirjäger German Division launched an attack towards Mook through the south and towards Berg En Dahl by the west which was under the remainder’s control of the 505th PIR. They also attacked the positions of the 508th PIR and took over Wyler and Beek. And advancing at a short distance of Berg en Dahl. But a counter-attack was launched which pushed back the enemy’s force and allowed to take Beek back. 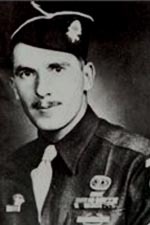 The next day, near Oosterhut, Pvt John Towle of Cleveland, Ohio, of the 504th PIR Company C was awarded a Medal of Honor. Armed with a rocket launcher, he took the initiative, alone, to be placed in an exposed position and to break through a counter-attack of more than 100 Germans, two panzers and SdKfz. He was finally mortally wounded by the barrage shooting of a German mortar. Delayed one week because of bad weather, the 325th GIR arrived in Holland on September 23. It widened the path while pushing back and chasing the Germans out of the wood of Kiekberg. The enemy launched an ultimate attack in the sector of the 508th, on October 1. Then, life on the front line was made of routine patrol. However the successes of the 82nd did not last long. Due to the defeat of the other allied units in Arnhem. The door towards Germany’s industrial heart will not open in September 1944, the 82nd was released on November 13 by Canadian troops Canadian after 56 days of combat. The division moved to Rheims, in France and became a reserve unit along with other airborne units. The commander of the division, James Mr. Gavin was promoted Major General in October. On December 16, 1944, the Germans launch their last big offensive through the Ardennes forest in a sector under little protection, taking the Allies completely by surprise. In the night of December 17, 1944, at 19h30, General Gavin receives a call from the SHAEF (Supreme Headquarters Al Expeditionary Forces) informing him that the enemy had crossed Belgium and Luxemburg in a powerful push launched from the south of Aachen. As the 82nd and the 101st were in Camp Suippes and Sissone in France, they were better situated to be sent as reinforcement. One of the principal objectives of the Germans was the catch of Liege. The mission of the 82nd Airborne is to hold a perimeter in the South-West sector of the city. It will hold during one week. Another task was to contact the elements of the 7th and 9th Armored Division and to provide a withdrawal itinerary for the 28th and the 106th Infantry Division that had been massacred by the combats. Right after the alert, the 82nd quickly prepared to join the front line. At the dawn of December 18, the men had not slept much but they were ready for combat. Large trucks were ready for them. The men were not at all in a good mood, they hardly had any rest after the operation Market Garden. For 13 hours and after having left Sissone, the convoy stopped in Werbomont, in Belgium, on the Liege-Bastogne road. The sound of canon coming from the east is the only indication of their proximity to the front line. While the men established a first defensive perimeter around Werbomont, many men wondered what all this agitation was; indeed, they had not yet been told. The 82nd set up its perimeter of defense and sent out patrols to collect information. The following night, on December 20, the 504th RCT advanced 13km to set up a perimeter of defense near the village of Rahier. The 1st battalion (minus one company dispatched in Brume) left for Cheneux. There, they started the combat against the 1st Panzer regiment of the 1st SS Panzer Division. The Paratroopers fought with rifles, knives and bazookas against Tanks and trucks. But after the victory, the 504th organized an “armored company” composed of equipment taken from the enemy. In the afternoon, the intensity of the combats increased and it seemed obvious that the enemy’s force had a higher number of men than first estimated. All the components of the 504th RCT were in lines. The anti-aircraft canons, the 75mm canons, the mortars, the mobile artillery and the machine-guns created a fatal barrage to defend the paratroopers who were in first line and were trying to advance in a field of more than 365 meters out in the open with intervals every 15 meters barred by barbed wires. They jumped on the enemy’s lines, on their SdKfz with their machine-guns, their rifles, and fought the Germans with anything at their disposal, even with bare hands, all night and all morning of the 21st day. In the middle of the morning, the village was in their hands, the 3rd battalion carried out a circling movement to enter the village from the north. A control allowed counting 14 trucks transporting one anti-aircraft canon, 6 SdKfz, 4 trucks, four 105mm field artillery canons and one Panzer Mark VI that had been put out of combat or given up. The regiment used the vehicles still in good shape. The 504th RCT lost many men but inflicted the first defeat since the beginning of the campaign to the SS battalion and the German forces. The German prisoners were 31; half of them were wounded, which proves all the ferocity of the battle. This SS battalion was responsible for the massacre of the American prisoners in Malmedy, they were reimbursed with interests by the men of the 504th RCT. On December 21, 5 Germans disguised with American uniforms (a captain and 4 GIs) “were cruising” in two Jeeps. They stopped in various places of the sector behind American lines to provide false information to the front line. A little later in the day, they arrived at the HQ of the 1st battalion of the 504th at Cheneux. Pvt. Curious and intrigued by the hesitant answers of the 5 “GI' S”, holds up a bazooka on the group. This one fled, giving up the Jeep. Several paratroopers opened fire and wounded 1 of them but they succeeded in fleeing. But as they were recorded as paratroopers, they could easily be apprehended. From December 22 to the 24th, the 2nd battalion of the 504th moved towards the south, to Lierneux, to reinforce other units of the division. The 1st battalion did the same and moved to Trois Ponts. The 505th took over the heights of Haut-Bodeux near the position of Trois-Ponts north of Vielsam. The 508th took position at the crossroads in the east of Bra. And took over the higher lands of Rafter. The 325th remained in Werbomont but sent its 3rd battalion near Barvaux and to the crossroads of Manhay. In the night of December 22, the regiment was alerted of a possible jump of German paratroopers in their sector. Little before midnight, the parachuting took place, but instead of men, packages containing gasoline, ammunition and food supply,were dropped. They were apparently aimed at the encircled enemy forces in Staumont. Half a dozen of these packages were taken by the men of the 3rd battalion of the 504th. On December 23, the Germans took over the town of Regne. The 325th counter-attacked and took over the city once again until it received the order to withdraw. During this action, they made captive the regimental commander of the 2nd SS Panzer Division who carried orders for several days. These documents, of great value, proved that the objective of the Germans was to take over Werbomont. Thus the crossroads of Fraiture took an increasing importance. Colonel Billingslea of the 325th prolonged his right side to include that crossroads. He sent out company F under the command of Captain Woodruff. His company was pushed back by the 2nd SS Panzer Division. Between Malempre and Fraiture, the 2nd battalion of the 504th under the command of Major Wellems successfully containned the forces of the 2nd SS Panzer Division. The situation was fluid and motionless. A withdrawal was ordered on December 24. The 307th Engineers Battalion supported the withdrawal by destroying several bridges above the Salmonella and extending minefields. No accident took place on Christmas Day. It was a white Christmas. During the following weeks, the division pushed back 4 counter-attacks from the 62nd Volks-Grenadier Division and from the 9th SS Panzer Division. The losses were increasingly higher. A unit of the 9th SS Panzer Division passed ahead of the front stations of the 504th PIR 2nd battalion, but it was stopped and pushed back. The eagerness of the 82nd to not give up an inch of ground surprised the Germans. One week later, the 82nd attacked and regained its previous position on the high lands of Thier-du-mont. On January 2, 1945, the 1st battalion of the 504th left its reserve positions around Bra, to go release the 325th GIR on the right side. The German artillery opened fire on Bra setting the houses on fire. Then, the 329th Division of Infantry relieved the 504th in the sector of Bra. The 2nd and the 3rd battalion directly responded by attacking and by taking the high lands of Pit which overhanged the Salmonella River. The line along the Salmonella was held and improved until at January 11 when the 504th was released and moved by trucks towards Remouchamps. On January 10, the whole 82nd is released and given a rest for two weeks. On January 26, the division accepted the order to prepare the attack of the Siegfried line. The 1st and 3rd Armies were to get through the line. At 6h00, on January 28, the 82nd left its starting lines, the paratroopers in winter clothing better adapted to the cold weather advanced in column by two towards the forest of pin de Billingen. The 325th GIR were positionned to the left and the 504th PIR to the right. The Sherman Tanks were spread along the column in between each group. The column advanced for 12 hours, only meeting little resistance making half dozen killed and 25 prisoners. The artillery shootings fell in a sporadic way all along the route, wounding some paratroopers. The column had advanced 6 km and a half when the 504th reached Herresbach. The regiment attacked by the North-West and the South-East, it made 180 German prisoners and killed 138 others while not undergoing any losses. <- First Sergeant Leonard Funk Jr.
On January 29, the patrol of First Sergeant Leonard Funk Jr. of Braddock Township in Pennsylvania, of the 508th PIR Company C was awarded the Medal of Honor for its action in Holzheim, Belgium. Thanks to a trick, the Germans succeeded in releasing 80 captive Germans and making captive the 4 guards. Leonard Funk, patrolling around the building was surprised by a German officer when he felt the tip of a machine-gun touching his lower back. Pretending to obey the order to give up, he slowly put bullets in his Thomson and with a quick movement, killed the officer. He then released his men by killing 21 soldiers. At the down of February 2, the 82nd attacked the Siegfried line. The air was cold, the snow was amazingly thivk. The division followed the forest of Gerolstein. While moving with precaution from bunker to bunker, from strategic area to strategic area. However, it was obvious that the Siegfried line was not occupied. The defenders preferred to flee or give up rather than defend their homeland. At night, the 2nd battalion of the 504th had seized 900m of land overhanging the east of the Wilsam River. Its 1st battalion held the south-east to the Lewart River. The 3rd battalion took another route in order to circle the objective. It followed the 325th GIR through Neuhof then turned to the south to reach the left side of the 2nd battalion. At night, several counter-attacks supported by panzers, artillery and mortars tried to push them back but they courageously kept going. It was about courageous people such as Lieutenant Warren R. Williams of Dallas. He had to take the command of its Company after the death of the commander. And although wounded, he refused to be evacuated and led the attack of his men against the bunkers. If during the campaign, getting the supplies was a problem, at the time of the attack of the Siegfried line, it was even worst. Due to the weather, the snow and ice made the roads almost impracticable. After several uncomfortable days spent in the almost deserted village of Grand Halleux, the 505th RCT moved by truck to other side of the border, in Schmithof, Germany, the terminus of the railroad track. On February 13, the 82nd was sent on the Western banks of Roer where it had to be stationed and get ready to cross. The crossing of the river was postponed and the 82nd was released on February 19. The men were physically and morally very tired. They were sent back to France in Sissone going through Schmithof and Aachen. In Sissone, during their absence, the camp was transformed into two hospitals. The division was thus sent to Laon, 27km from Sissone. The division was back to the garrison life over again. The operation ECLIPSE was a daring plan for a parachuting of two paratroopers divisions to capture Berlin before the Russians. The objective of the 82nd Airborne was to take over two airports, Tempelhof and Rangdor, while the 101st Airborne would take over two others one. The plan was the work of Lewis Brereton of the First Allied Army Airborne staff. Wiston Churchill and Marshal Sir Montgomery agreed with the plan whereas General Eisenhower saw no strategic use in it. At that time an unexpected event occurred on March 7, the 9th Armored Division succeeded in taking over a bridge crossing the Rhine in Remagen. On March 22, General George Patton in a daring action ordered the 5th Infantry Division to cross beyond the Rhine near Mainz. Consequently, the operation ECLIPSE was cancelled. On March 30, 1945, the 82nd is already gathered in Sissone, France for the operation (which was countermanded). They received the order to move inside the area of Bonn in Germany and of the Rhine River. Colonel Tucker and a small group of the 504th PIR left Laon in France and covered a distance of 435km to Cologne in Germany. 3 days later, the regiment arrived and immediately took position along the Western banks of the Rhine. Patrols crossed the Rhine in boats engaging combat each time they were patrolling. The enemy also tried to cross the Rhine in the sector of the 504th but each attempt was pushed back. On April 6, the company A of 504th PIR crossed the Rhine at 2h30 and immediately made contact with the enemy. Under fire and through the minefield, the first wave of the 504th was cut in two elements which fought independently. They established road barrages. By using the same tactics, they infiltrated the village of Hitsdorf. Then for several days, the situation calmed down. At this point in time were launched the enemy counter-attacks. The first was less than 45m from the perimeter of defense when it was pushed back. The second was preceded by an artillery bombing. The Panzers and the infantry were in higher numbers compared to company A. Company I was sent to the rescue to help them withdraw. The losses reported for the 504th were 9 men while the Germans had lost 150 men. For the men implied withdrawal, the situation made them think of a small “Dunkirk”. One week later the 505th witnessed the rendering of the towns of Lulsdorf, Langel, Zundorf and Niederkassel. The 82nd remained in the area of Cologne until the end of April. On April 30, the 505th crossed Elba in Bleckede in an attack recalling the cross of Waal 7 months before. The 504th followed them the day after and the 325th on May 2. On the same day, General Gavin accepted the rendering of the 21st German army, with a force estimated at 144.000 men commanded by General von Tippelskirch in Ludwigslust, Germany. On May 4, 40km to the East, a patrol came into contact with the Soviet troops. The war is officially finished in Europe on May 5, 1945. The 504th is briefly gone back to Nancy, France until the 82nd Airborne, the 11th British Armored Division and the 5th Russian Division Cossacks were invited to serve the occupying forces in Berlin. That is where the 82nd got its nickname “America' S Guard off Honor” by General Patton for its actions, and because of the fact that it had driven out the German army on approximately 23.000 km throughout the European theatre.